I have a little but interesting suggestion. 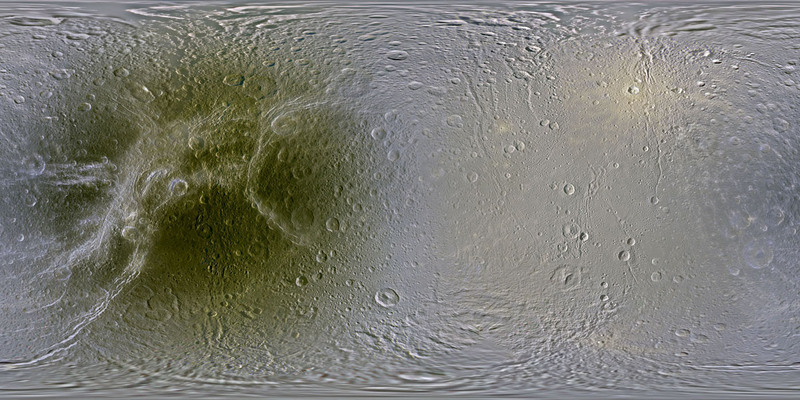 This are the maps of Thetys, Dione and Rhea as Cassini has completed them this year. Do you notice something in common? Maybe the fact that one hemisphere looks dark and the other looks quite clean? Well it turns out that this three satellites are tidally locked to Saturn and the darkened face is exactly that pointing in the direction of motion on their orbits. Thay have discovered that the dark hemispheres are due to the satellites moving through particles in the radiation belts of Saturn. The surface in one part of the moon is constantly bombarded and coocked and the other is shielded because of the moon itself. This asymetries in the surface colouring are created like that. Since it looks like it's relatively common to see this feature (at least in 3 of solar system's moons) I want to suggest that this can be added to the TODO-list. Maybe little tidally locked selenas around giants (with radiation belts) could have the sides that always face forward as the moons orbit the planet a little darkened and redder than the rest of the surface. This can't be to difficoult to add and is kind of cool considering the realism issue. 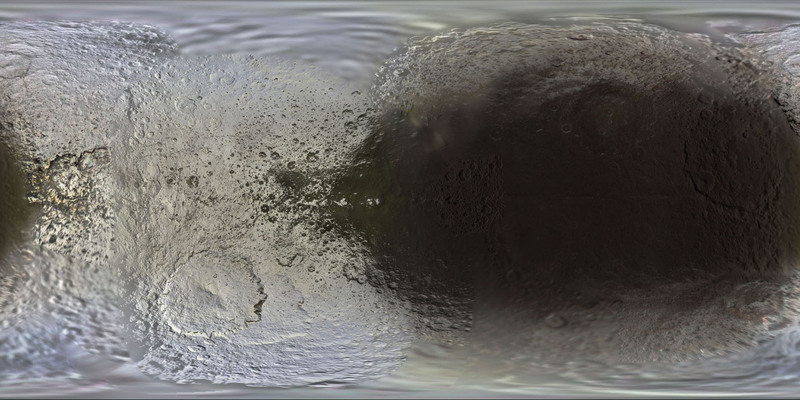 For all of you that want more, here is a map of Iapetus. And Iapetus happens to be also a tidally locked moon, but instead of a darkened side due to charged particles colliding for millions of years with the terrain it has in the direction of motion a brighter side. A side made of specular and clean snow. 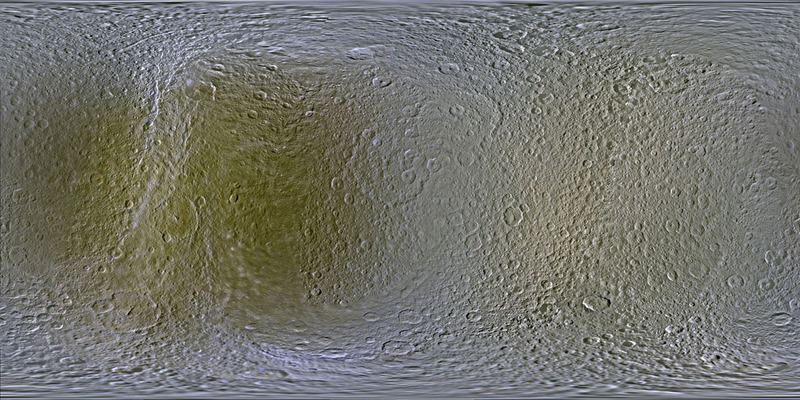 This happens because this moon absorbs like a shield the ice particles of the E-ring (formed itself by the materials ejected from geysers on Enceladus). It's snow sprayed by an other moon that colours Iapetus. Nature is always epic! Maybe one day Space Engine could predict also this kind of interactions and formations on satellites around the universe. This is already implemented, it's a parameter called DrivenDarkening. FastFourierTransform, yes SE have alreasd this implemented in 0.971. Also, you correctly understand the cause of darkening, but you mixed out the hemispheres. 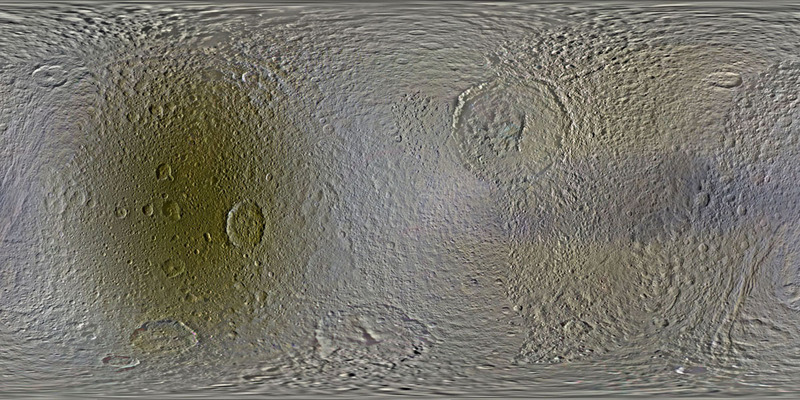 Thetys, Dione and Rhea have a dark trailing hemisphere, while Iapetus have a dark leading hemisphere. In all cases the cause is a bombardment by the charged particles from the Saturn's magnetosphere, causing a chemical processes in a surface ice what creating complex organic molecules. But why trailing hemisphere? Because charged particles are rotaties around Saturn with its magnetosphere, they are like "frozen into" the force lines of a magnetic field. Saturnian magnetosphere rotates with Saturn's body with a period of 10.5 hours, but moons are orbits Saturn with a period of several days, so charged particles are overtakes satellites and hits their trailing hemisphere. Iapetus have a darker leading hemisphere because of another mechanism: it accumulates a dust particles from the outer retrograde satellites of Saturn. You can read about it in Wikipedia. yes SE have alreasd this implemented in 0.971. Also, you correctly understand the cause of darkening, but you mixed out the hemispheres. Wow, thank you a lot for answering me and for explaining the phenomenon in such detail Really? in SE? thats trully awesome!!! Hey, I have a question. I don't know if it's appropriate to ask on this thread or not, but since this is about upcoming features and because I haven't found anything about it, I figured this would be the best place to ask about it. Considering we've seen pictures of accretion discs for black holes, can you tell us whether these are also programmed to appear around protostars and certain brown dwarfs? The accretion disks around black holes you have seen in this thread are acreation disks that suffer such intense tidal forces that all inhomogenuities are erased and the matter is presented in the plasma form because of the intense energies involved. The accretion disks around stars (or farther away from the event horizon of the black hole) are quite different, they are not non-tubulent thin plasma dishes but rather complex, tubulent, evolving, clouds of gas and dust distributed in a toroidal shape around the star. The thin plasma disks featured by SpaceEngineer for the 0.9.7.2 version are quite realistic (maybe they need little turbulent patterns inspiraling to be improved). 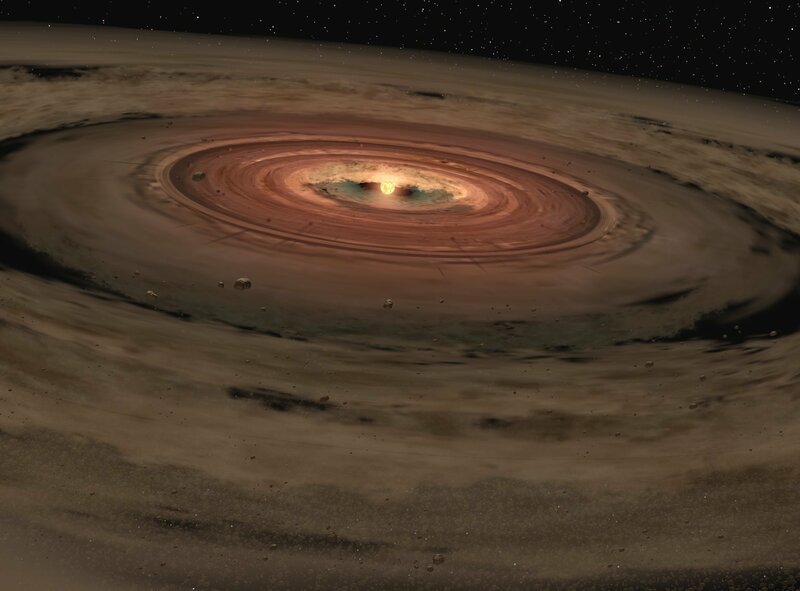 But protoplanetary disks are extremely complex and present a lot of diversity in forms and phenomena (this is shaped by gravitational interactions, magnetic interactions, composition, geometry, presence of other objects as planets and nearby stars, stage of life of the star ect...). Say... why would we need volumetric clouds? As far as I know they aren't cheap on GPU power. Couldn't the discs be rendered in the same way that galaxies and nebulae are? Not trying to argue you on this. Just curious. To me it doesn't seem that the engine is incapable of generating a brown/red/orange circular nebula around a star and sprinkle it with asteroids. Is that too far-fetched? So, I know I've missed something, I'll admit that up front. But, the partial implementation of the in-door engine that's mentioned, are we able to experience that feature (even though it's only partial) to some degree? are we able to experience that feature (even though it's only partial) to some degree? I don't know if it's usable in the current version though. Hi Spaceengineer! A must is to add Oculus Rift Head Tracking. I put on my oculus, and i'm exposed to this BREATHTAKING view on a mountainous, atmosphere-less moon, looking at its parent planet. When i try to move my head, though, the experience is totally taken away, because it is a stationary image. Please try to implement this! Fox, head tracking is implemented. If it's not working then there must be some problem. Are the beams emitting from a pulsar planned ? Ah ! My question was in fact "planned soon ?" But I guess I just have to read the todo list more carefuly. Alternatively you can add comets to the center of cataloged pulsars and their trails will look like the jets.